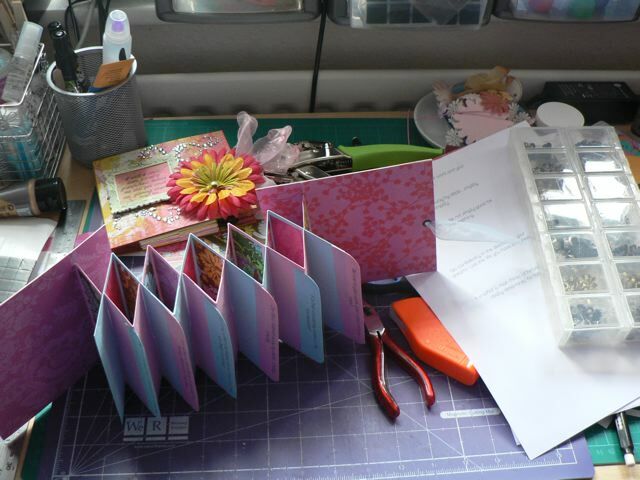 Today, between driving to DDs school and back (over an hour for an Easter Assembly that took less time than that to watch) and a follow up orthodontist appointment, I have been making another little concertina album, and photographing it for a YouTube video. This one is altogether brighter and I worked out a few design flaws – well, not so much flaws as better ways of doing things. I may do both a video and a PDF. I am liking this album a lot and while it looks very complicated it really isn’t – the only thing is selecting and resizing the photos for the very small strips needed for the pages. But overall, I like the look and am having fun playing with the process and the results. A big win/win. I’ll be taking a little break over Easter – while I may be able to post I am not sure about adding photos, we’ll see. I suspect my posts may be more about the stash haul (How cool my sister has a Michaels, an AC Moore, a stamp store and an LSS in her area! AND she had a windfall in her Sunday paper – somehow she got SIX flyers with an assortment of Michael’s and AC Moore coupons AND the week I will be there has not one but TWO big discount days (one 50% off your total purchase and one 30% off) as well as a Cricut sale day and a day when all the K&CO paper pads are 40% off) – I already know a big box from Stampotique is waiting for me (although she declared the stamps “creepy” and is anxious to see what might be done with them) and she was off to check out the stock levels today. I’ve not bought much over the last year except the full set of Tim’s new Distress colours and the QVC TSV and some Cuttlebug embossing folders so I must try not to go wild in the stores! Yeah…..right….. Categories: WOYWW | Tags: mini-albums | Permalink. Forgot to comment about the other album you made like this, but I love these! Very cool and I really love the bright papers in this one!